I’m Jesse Hanley and I run TextGoose, RankingPress and am currently launching FitMonk.com.au in the coming months. My main thing is marketing and helping businesses grow online. I also have a team of developers who do custom software development. I travel and work remotely so this is my usual tech stack that I carry with me everywhere. This photo was taken at the Sofitel hotel in Heathrow Airport last week. Can you tell me something about the items you take with you? I travel with one backpack (Tortuga) and one day pack (Moleskin backpack - not functional, but fashionable!). In it I have a range of clothes covering all occasions (lots of amazing board shorts) and 3 pairs of shoes. For tech I carry a Macbook Air, Blue Yeti, Sony A6000, iPhone, iPad, Bose headphones and lots of cables. I had more more but shipped it back home as it was getting to heavy and rarely used ‘em. Is there anything you would like to change/improve about those items? I’m heading back to Sydney for a month to repack before going back to Asia again. I’ll probably take less with me this time because I honestly reuse clothes so much that I don’t need much to live. 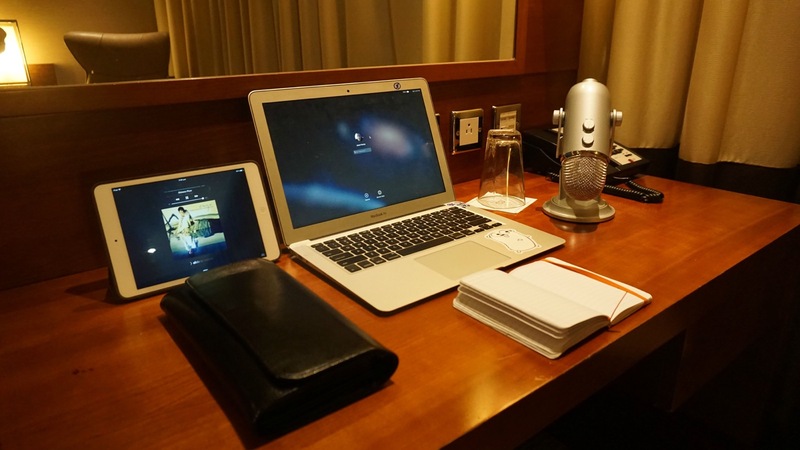 How do you stay focused while working / traveling? Good systems. I have a system where I write down a daily list of tasks to do and just do whatever it takes until they are all marked off. These daily tasks fit into my monthly goals and as long as I complete them I don’t stress too much. In the coming months I’ll be locking myself in a room in Thailand (chiang mai) to really crank out some quality work but for the most part I just focus, get work done then relax.